Aahhh... its Fat! Something we crave for every day. We are trying to eliminate them from our diet but it isn't working out. So, how do we get rid off them completely? An eye opening truth is that you will have absolutely no ill health if fats are consumed in the right amounts. Its consumption depends upon age, weight, height, your lifestyle and overall health. 1. Use "good -for- you" fats like poly unsaturated fats - soyabean, mustard oil etc and mono unsaturated fats - olive oil, sunflower, groundnut oil, sesame, canola oil etc instead of saturated and trans fats. 2. Choose fortified oils that are rich in Vitamin A, D and E to improve your overall health. 3. Read through the food label before you buy one, so that it you know what your oil contains and can be confident of your health. 4. Select small oil bags which will reduce the preparation of fried foods and in turn, keep diseases at bay. 5. If you are a non-vegetarian, cut down the intake of red meat and incorporate fish- especially salmon, herring or mackerel as they are rich in essential fats like omega 3 fats. Avoid frozen and canned products as they may contain hydrogenated oil. 6. Use Mono unsaturated oils as dressings for your salads instead of butter, cheese, mayonnaise and margarine. 7. If you are a salad lover, top up your salads with avocado and olives. They are great source of essential and monounsaturated fats, which are shown to reduce the risk of cancer and heart ailments. 8. 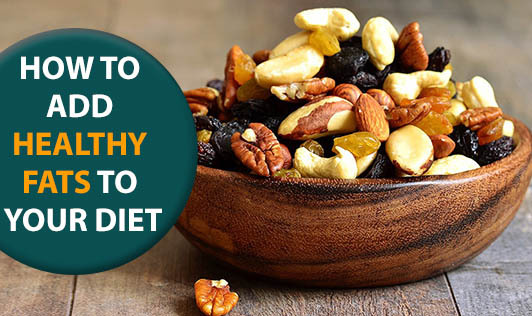 Nibble on some nuts like almonds, walnuts and peanuts to derive omega 3 and omega 6 fatty acids instead of fast and fried foods at high tea and parties. 9. If your fat consumption is higher for a meal, try to cut down your intake of sugar, salt and carbohydrates for your next meal. 10. Enjoy sensible portions of lean cuts of meat and poultry to keep saturated fats in check. If you are calorie conscious, speak to your dietitian to know -How much of fat is too much? Also, be an educated shopper and understand the pitfalls associated with fat usage.